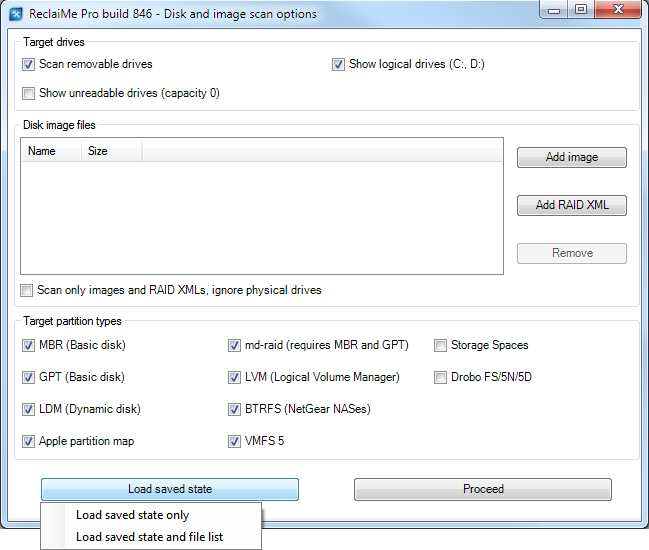 In ReclaiMe Pro you can save the current state of data recovery process to a file. To do that in the Files and folders window click the Save state button and specify the location to save the file with current configuration. The Save state button can be either enabled or disabled depending on whether the state can be saved at the current moment. Usually the button is disabled within several minutes at the beginning of the recovery. You can easily estimate the size of the saved state file based on the rule – 200 MB per 1 million objects. To know the total number of objects found put the cursor on the root filesystem folder and look at the This folder. Note that saving the current folder tree does not take into account marks you set. If you need to save the marks as well, refer to the export and import file list capability. Load saved state and file list. Note that if disk image files were involved in the previous run, you need to load all the necessary disk image files before loading the saved state file. Once you have loaded the saved state file, you can use ReclaiMe Pro in the same way as a regular run, for example proceed with filesystem scan (Resume/Pause button) or start copying the recovered data. After clicking this button, the window where you should specify a location for the saved state file appears. As soon as ReclaiMe Pro loads the saved state and scans the connected devices, you see the Files and folders window with the previously recovered folder tree. Use this loading mode if you have already exported the list of files. Once you have loaded the saved state file and file list, ReclaiMe Pro reconstructs the folder tree along with all the marks.